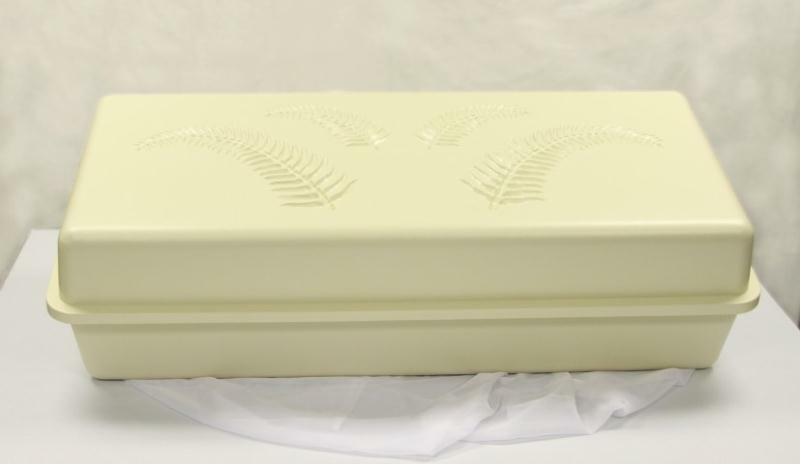 The Hoegh #52 Pet Casket is built for lasting durability and quality. All units are constructed of strong, high-impact styrene. The design and special sealant restrict seepage of water and the intrusion of air. Hoegh pet caskets are capable of serving as a Casket-Vault combination. The #52 is available in the Regular Style only and is a single wall unit. It has been vacuum formed from a quarter inch thickness of High Impact Styrene. The exterior is almond colored and the interior consists of a pad and pillow covered with a Rosetan crepelike material trimmed in a ginger colored lace. The pillow is enhanced with a floral applique. In addition to the sealant, eight plastic tie downs are included for a secure closure. Inside Dimensions: 52" x 22" x 15"